I have read and complete the prerequisite procedures before posting this log. Any help is appreciated. 2. During normal computer use I received "trojan.downloader.xs popup" as well as yellow triangle in system tray. 3. Panda Scan indicates my computer is infected with "Trj/Rebooter.J "
4. Super Anti-spyware indicates my computer is infected with "
5. Computer is def slower than it used to be and have had several virus detections from AVG. another bump, whenever any of the experts get time I'd like someone to check my logs please. Hello and welcome to Geeks To Go! My name is BHowett and I will be helping you to get sorted. Sorry for the delay, as you can tell we are very busy here . "2008-04-04 08:15:07 C:\Windows\Tasks\Check Updates for Windows Live Toolbar.job"
Got a quick question for you… I see in your log you are using AVG for your antivirus, however I also see that you have Symantec AntiVirus on your system that’s showing disabled in the registry. I just want to make sure that you set Symantec as disabled? Results from Jotti File Submission, and a fresh HijackThis log. Also let me know how your system is running. Symantec in the registry was from a version I tried to install, it turned out the version I tried to install was not vista compatible. Jotti Scan: The file you uploaded is 0 bytes. It is very likely a firewall or a piece of malware is prohibiting you from uploading this file. My system seems to be running good, startup is slow but I believe this is from all the programs are set to run on startup. Also there isn't a missing .dll error anymore so thank u for that. The directory for " C:\ProgramData\fwbyrmzq\zwjefebu.exe" exist on my computer but the "zwjefebu.exe" file does not. I have my computer set to show hidden files too. After that, Reboot, and post a new HijackThis log here in your reply. 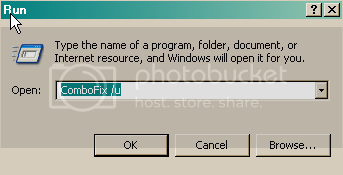 did you want me to uninstall combofix after I delete the file in safe mode? This is my standard post for when you are clear - which you now are - or seem to be. Please advise me of any problems you still have. b]Disable and Enable System Restore. [/b] - You should disable and re-enable system restore to make sure there are no infected files found in a restore point. 2. Right click Computer > Properties > Choose Advanced System Settings option in left menu listing.